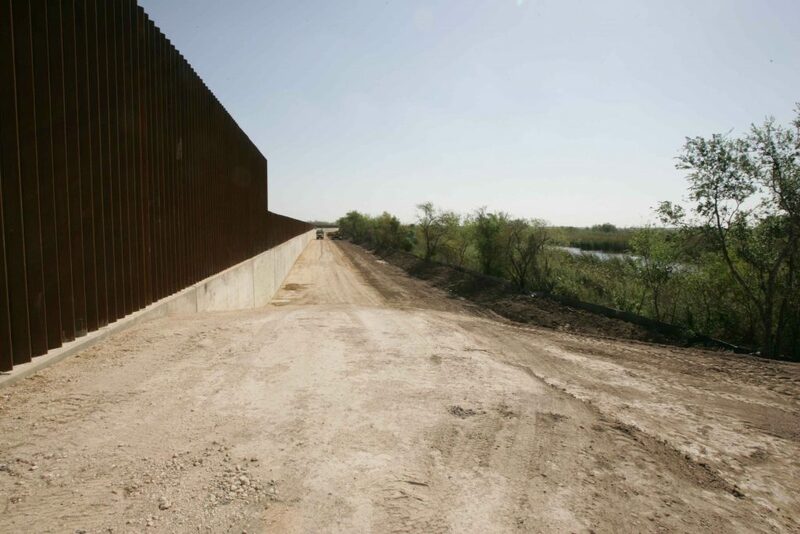 Photo of the border wall between Mexico and the United States by Steve Hildebrand, U.S. Fish and Wildlife Service. At a raucous 2016 campaign rally in Phoenix, Arizona, then-candidate Donald Trump outlined his plan to curb “illegal immigration” and to “restore law and order” to the United States. Not only did the Republican nominee promise “no amnesty” for undocumented migrants living in the U.S. but he further vowed to build a “beautiful” and “impenetrable” border wall which he claimed would be subsidized by the Mexican government. Trump’s unswerving obsession with securing the U.S.-Mexico border—despite the fact that most undocumented migrants living in the U.S. are not “border crossers” but rather formerly documented immigrants who have since overstayed a work visa (the majority of whom over the last year were Canadian)—suggests that Trump’s idiom of “no amnesty” serves as a political technology of white supremacist exclusion. In The Racial State, theorist David Theo Goldberg argues that “racial rule is caught always in the struggle between subjection and citizenship…[because] modern states are intimately involved in the reproduction of national identity and national population in and through the articulation of race.”Amnesty, in short, is one means by which modern states amend, augment, and sustain their racial configurations both geographically and discursively. Within this framework, Trump’s promise of “no amnesty” appears premised on the ideological assumption that undocumented migrants of color, generally, and Mexican migrants, explicitly, do not have legitimate and defensible claims to U.S. national belonging. Trump’s plan to withhold unconditional amnesty, therefore, serves to (re)center whiteness as the paradigmatic reference point for U.S. citizenship and legitimate national belonging. To this end, I argue that the political viability of any carte blanche amnesty program hinges on the racialization of its beneficiaries as white. Google Ngram of the word “Amnesty.” The Ngram tracks the use of a word in published materials within Google’s archive. In total, over 1 million white Confederate soldiers were granted full amnesty by 1868, a figure that represents close to 20 percent of the Confederacy’s non-enslaved population. Recall that just 3 years before proclamation 179, President Johnson overturned Union General William T. Sherman’s Special Field Order No. 15—an idea hatched by formerly enslaved Black ministers in Georgia—to offer 40 acres of land to recently emancipated Black persons. Such a juxtaposition is emblematic of the logic of the U.S. racial state: provide civic inclusion for treasonous white confederates and continue a policy of civic exclusion for newly liberated Black children, women, and men. 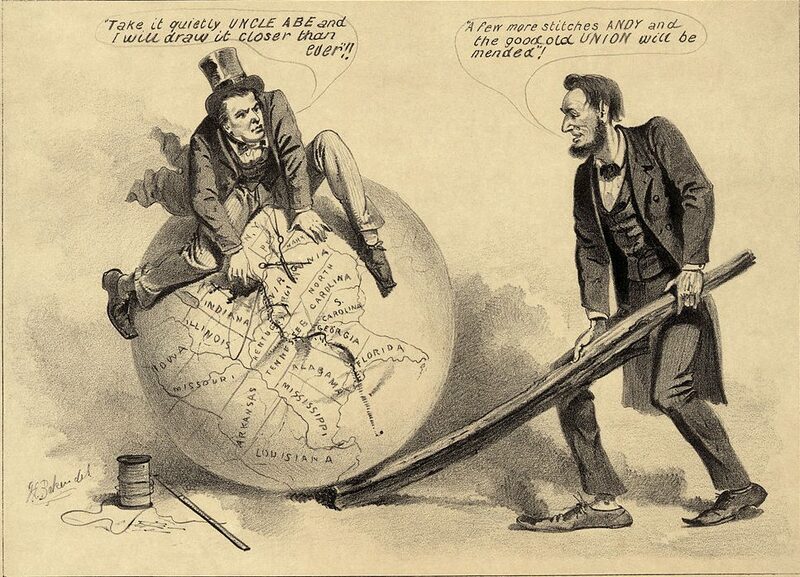 Johnson’s strategic re-birth of the nation—“a country for white men [and] a government for white men,” in his words—helped to alleviate the crisis of whiteness generated by the Civil War and recenter its homogenizing supremacy. 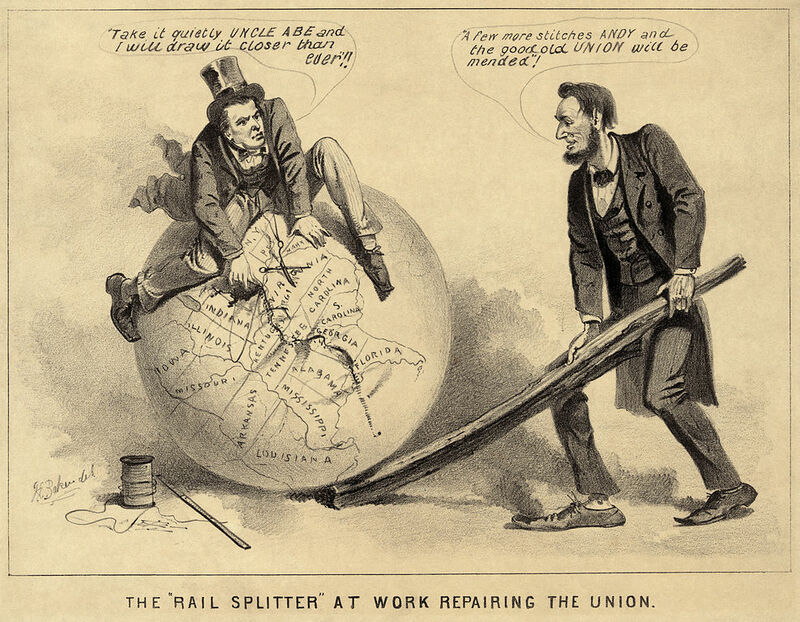 “The Rail Splitter Repairing the Union”—a political cartoon of Andrew Johnson and Abraham Lincoln from 1865, during the Reconstruction era of the United States (1863–1877). Four years after Johnson’s amnesty for white Confederates, Congress passed the Amnesty Act of 1872, a bill that extended Johnson’s pardon and returned the right to hold office to most of secessionists who has committed treason during the Civil War. In total, the Amnesty Act of 1872 as implemented excluded only 500 Confederate sympathizers such as Confederate President Jefferson Davis and General Robert E. Lee. Moreover, the Act included a provision to return to Confederate citizens their property and homes. Over one-hundred years after the passage of the Amnesty Act of 1872, a number of U.S. lawmakers penned resolutions to restore full citizenship rights to Robert E. Lee and Jefferson Davis (in the case that they wanted to run for public office or vote from the grave). In early 1975, U.S. Senator Harry F. Byrd, Jr.—an avowed advocate of segregation—introduced Senate Joint Resolution 23, a bill to restore General Lee’s citizenship. The resolution was quickly passed by both houses and was signed by President Gerald Ford on August 5th of the same year. Three years later, in 1978, U.S. Senator Mark Hatfield introduced Senate Joint Resolution 16 posthumously restoring citizenship to Jefferson Davis. During his introduction, Hatfield described Davis as “an outstanding American.” The resolution was passed unanimously and was quickly sponsored by members of the House. On October 17, 1978 President Jimmy Carter signed the resolution into law and proclaimed that “in posthumously restoring the full rights of citizenship to Jefferson Davis, the Congress officially completes the long process of reconciliation that has reunited our people following the tragic conflict between the States.” Carter’s language of “our reconciliation” is instructive. What does it mean that Congress was willing to offer unequivocal pardons to Jefferson Davis and Robert E. Lee a full 30 years before issuing an official apology in 2009 to Black Americans for slavery? One is left to conclude that the idea of amnesty itself is only legible through a priori claims to civic belonging, a concept itself that is racialized as white. Current debates over the propriety for amnesty for undocumented migrants of color should be placed in this context. Amnesty, in short, serves as a political technology to ratify the legitimacy of racial inclusion and exclusion and claims to full belonging in a modern state that inexorably seeks to amend, augment, and sustain its racial configurations. Unconditional amnesty is not a colorblind proposition; to be sure, its current (un)popularity and perceived (il)legitimacy is and always has been premised on the racialization of its beneficiaries and the variegated ways in which it gets marshaled in the political imaginary to re-situate whiteness at the center of the U.S. racial state.